This is part one of a 10-part series. Author Nick Raymond with the Wave Energy Converter in Bodega Bay, Calif. This is the most ambitious and complex endeavor that I’ve ever undertaken. For the past nine months I’ve been leading our small team of mechanical engineering students as we designed, built, and tested a prototype device capable of converting the motion of ocean waves into renewable electricity. 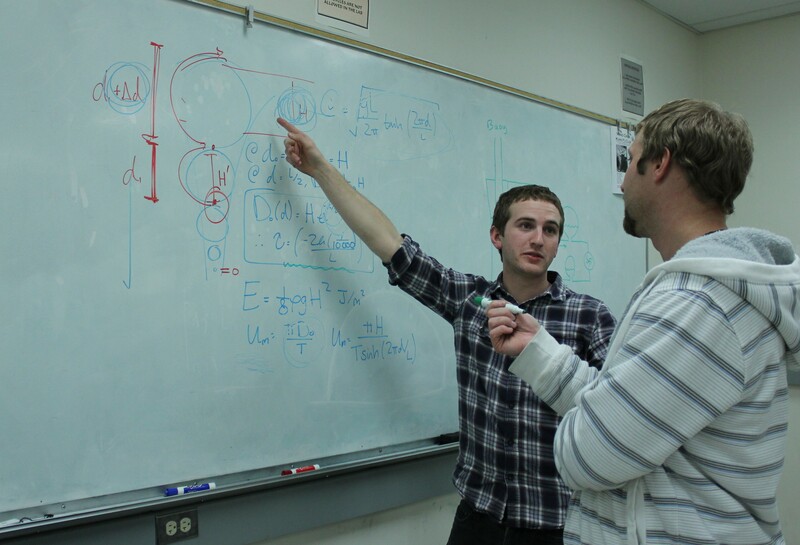 After winning the 2012-2013 CITRIS Undergraduate Sustainability Research Competition in December 2012, our senior year of college became a lot busier. Wave energy converters fall under the broader category of ocean power, a technology that has been around since the early 70s and is currently undergoing rapid growth in Europe and regions of the U.S. Some forms of ocean energy harness power from the rise and fall of the tides, while others (like our design) are meant to convert energy from the up and down motion of ocean waves. These devices typically generate electrical energy than can be sent to shore through underwater power cables, and therefore have the potential to become a significant source of large-scale renewable energy. 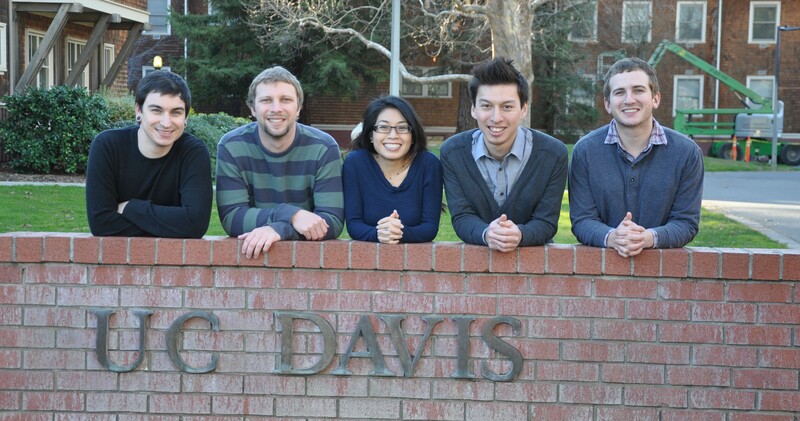 The team (from left): Nick Raymond, Tom Rumble, Teresa Yeh, Kevin Quach, Alex Beckerman. A project of this magnitude and complexity would be doomed from the start if not for the dedication and commitment of its team members, and back in December I was lucky enough to stumble upon a fantastic group of individuals who have all worked tirelessly to make this project possible. Once I learned that the grand prize was a $10,000 research grant, I had to assembled a team quickly in order to complete the application process. 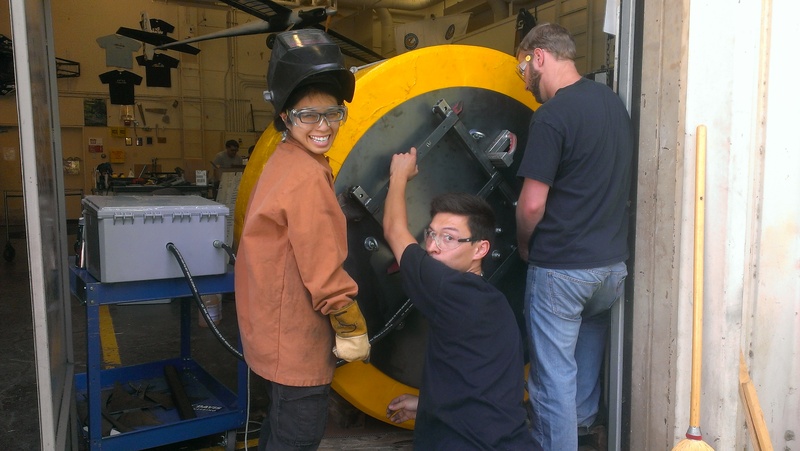 As fate would have it, all seniors in the University of California Davis engineering department have to complete a senior design project before graduation. So I casually mentioned the idea of ocean power to two classmates, Alex Beckerman and Teresa Yeh, and they seemed intrigued. Interesting ideas have a way of self-propagating, and within two days both Teresa and Alex mentioned two other students who would be interested in joining our group. Suddenly we had a team of five mechanical engineering students, all with vastly different backgrounds and areas of expertise, coming together as a group for the first time. 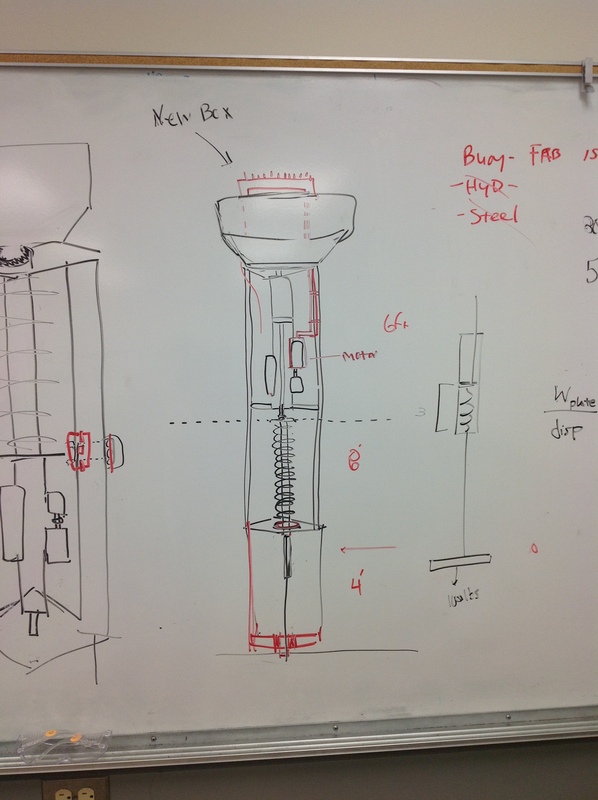 One of the final sketches before the team decided on the final design. At the first team meeting we talked about my past endeavors with ocean power. Two years earlier I had built a tiny wave energy converter model using neodymium rare-earth magnets and wire coils inside a PVC pipe for a class project at my community college. I even had managed to build a “wave tank” out of a 50-gallon fish tank I picked up from the freebie Craigslist ads. Everyone asked questions, we did a ridiculous amount of Google searching, and we all took turns being confused. These were completely new and foreign concepts, and in the beginning it was hard to just communicate our ideas to one another because everyone was constantly using different jargon and naming conventions when trying to describe the various parts and components. Alex and Tom trying to communicate at the whiteboard. Most of the time it was faster and easier to draw a crude sketch on the white board and jump up and down and point. “This is the part I am talking about, this thing right here, it should go up and down, while this other part over here should stay stationary.” Then someone else would walk up to the board and make their case as to why they disagreed with that logic, pointing to a different part of the drawing or adding their own scribbles. Beyond being a simple brainstorming session, these activities really helped everyone on the team get to know each other and helped us figure out the ways in which each of us preferred to learn. It sounds trivial, but once we all began to use the same terminology we hit a groove and the team just meshed. It didn’t matter if we were in the design phase performing calculations and generating computer simulations, or in the machine shop cutting and welding and pouring foam. This has been a team effort from start to finish, and in later articles in this series, it’s my hope that you’ll get to know each of the members even better as your learn about their critical roles and contributions to the project. Team members Teresa, Kevin, and Tom hard at work in the student shop. This will be a 10-part series about the trials and tribulations of building a wave energy converter. Throughout the project, our mission has always been to promote the idea of ocean energy and share our designs with the maker community. During the design phase, the team really tried to develop a system that primarily used off-the-shelf components so that fellow enthusiasts could replicate what we had done. I’ll be the first to admit that some aspects of the project deviate from this goal, but this initiative is also meant to be a living project and we hope it will continue to be improved and updated by makers, scientists, engineers, and hackers. We’ve been working on an instruction manual of sorts, and have feverishly documented our build process, so that others might read about our design and learn from our successes and failures. In this series I’ll be recounting the journey that began with sketches on paper and quickly grew into a 40-foot-tall device made of steel and foam, sharing images and videos from all of our fabrication and testing. At the end we’ll launch the instruction manual as a free PDF download with even more details about how it was built. Are you interested in alternative energy and finding unique solutions to the global energy dilemma? If so, I hope you’ll follow along and get involved by sharing your ideas and thoughts in the comments. 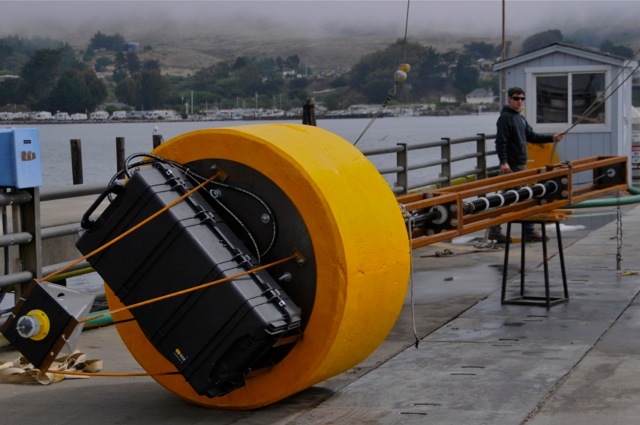 Deploying the Wave Energy Converter just off the coast in Bodega Bay, Calif.